What are the Benefits of the Portland Platinum Discretionary Managed Account Program? Portland Platinum Discretionary Managed Account Program provides you with an opportunity to access quality institutional investment managers and investment strategies in both public and private markets. 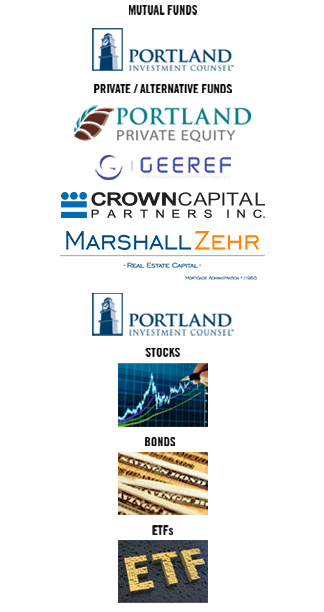 With a minimum account size of $250,000, this program is designed for investors who are serious about being provided a full-service portfolio solution utilizing Portland Investment Counsel’s proprietary public models as well as access to Portland Investment Counsel’s exclusive private equity offerings that are typically reserved for affluent private clients and large institutions. We craft our client’s portfolios by selecting quality public and private investments based on the client's individual needs. Expertise: Our wealth management team has many years of business experience. Access: This program gives you unparalleled access to PRIVATE investment products similar to those investments of the preeminent pension plans. Wealth Creators: We are wealth creators with a track record of success. Approach: We do not let our emotions corrode our decision making framework. Our framework is our 5 Laws of Wealth Creation: 1. Own a few high-quality businesses, 2. that you thoroughly understand, 3. that are domiciled in strong, long-term growth industries, 4. that use other people’s money, prudently, and 5. that are bought at attractive valuations and held as long as the company remains high quality and at a reasonable valuation. Innovation: We are pioneers in our industry, providing our clients access to quality public and private products. Integrity: We act with integrity above all else. We value and protect our reputation. Clients’ Interests First: Our client’s interests come first and each program is tailored to meet each client’s needs and objectives. Teamwork: We value teamwork and hard work in order to accomplish our goals. We act as a team to optimize our diversified skills and experiences. Community: We are a corporate citizen that is part of a larger community. We strive to 'do well and do good' by sharing our success and giving back to society.